Many scholars who research on local history believe that the history of the Tung Wah Group of Hospitals (TWGHs) forms an important part of Hong Kong’s societal development. From the early development of Hong Kong until today, the Group has been providing the much needed welfare services for the community, such as free medication, education and burial for the underclass and relief for victims of natural calamities. 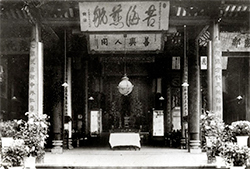 Established in 1870, the Tung Wah Hospital (the group’s pioneering operation) is widely recognized as the first hospital in China having adopted western hospital mode in providing Chinese medicine services. 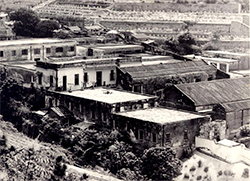 Later, Tung Wah Hospital gradually replaced the Man Mo Temple’s leading role to arbitrate in disputes in the local community. In 1880, the hospital established free schools, which eventually adopted modern teaching methods in the 1920s and 1930s, was recognized as one of the leading organizations that provided education for children in poverty. TWGHs had essentially transcended the limitations embedded in traditional social practices such as indigenous norms, ancestral roots, dialects etc., and had developed organizational features of a charitable body unique to the colonially ruled territory. 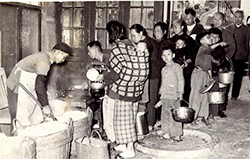 In addition, the Tung Wah Coffin Home had since the 19th century been delivering a distinctive welfare service in Hong Kong – bone repatriation services for Chinese abroad, which signifies the reputation that TWGHs had enjoyed worldwide. From all these, we can see that the development of the Group play an important role in the development of Hong Kong’s medical, education and community services. TWGHs has been all along upholding its mission “To heal the sick and to relieve the distressed; to care for the elderly and to rehabilitate the disabled; to promote education and to nurture youngsters; and to raise the infants and to guide the children.” Nowadays, TWGHs is the largest charitable organisation with the longest history in Hong Kong. For over a hundred years, TWGHs’ medical and health, education and community services have developed rapidly to fulfill the needs of the society and to provide high quality services at low rates or for free. Today, TWGHs operates 321 services centres, including 5 hospitals and 30 Chinese and Western medicine services centres, 55 education services centres, 229 community services centres that cover elderly, youth and family, rehabilitation and traditional services, as well as the Tung Wah Museum and TWGHs Maisy Ho Archives and Relics Centre, which were established to promote, restore and preserve the heritage and relics of TWGHs, with an aim to protect and preserve local traditional culture. With 35 service units in total, including 5 hospitals (Tung Wah Hospital, Kwong Wah Hospital, Tung Wah Eastern Hospital, TWGHs Wong Tai Sin Hospital and TWGHs Fung Yiu King Hospital) with a total of 2,644 beds. 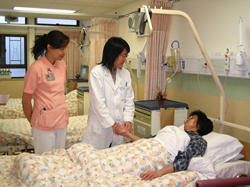 Other medical and health services and Chinese medicine services provided by TWGHs include 5 Chinese medicine clinical centres located in Kwong Wah Hospital, Tung Wah Hospital, TWGHs Wong Tai Sin Hospital, Tung Wah Eastern Hospital and Pamela Youde Nethersole Eastern Hospital; 5 integrated Chinese and Western medicine treatment centres/service units, 1 centre of integrated health management, 2 Chinese medicine mobile clinics, 1 Chinese medicine community clinic, 1 Chinese medicine control centre, 1 centralised decoction centre, 2 Chinese medicine general outpatient clinics, 2 well women clinics, 1 integrated diagnostic and medical centre, 1 computed tomography imaging centre, 1 endoscopy centre, 1 haemodialysis centre, 1 rehabilitation centre, 3 dental clinics and an establishment in support of the outreaching dental services for the elderly. The medical and health services of TWGHs aim at providing western and Chinese medical services to the community – free of charge for the needy, as well as expanding services which fall out of the current public health system to cater to the specific needs of the community. 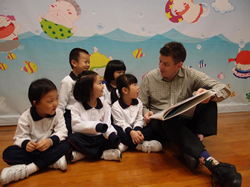 With 55 education services centres, including a Tung Wah College, 18 secondary schools, 14 primary schools, 16 kindergartens, 2 special schools, a Educational Psychology Services Centre, a talent education centre, an academy of music and a playgroup centre for pre-school children. TWGHs’ mission in education is to provide comprehensive and multifarious services for children and young people to enable them to develop their full potential and eventually to serve the community. The school motto “Diligence, Frugality, Loyalty and Trustworthiness” is the guiding principle in the moral and intellectual development of the students. We strive to promote proper values and a positive outlook on life and encourage students to lead a rich and meaningful life. With 229 community services centres, including 65 elderly services centres, 75 youth and family services centres, 49 rehabilitation services centres, 22 social enterprises centres and 18 traditional services centres. 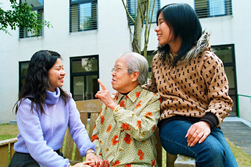 TWGHs community services aim at providing a spectrum of social welfare services catering to the needs of families, children and youth, the elderly and the disabled, as well as Chinese traditional services for the community in accordance with the main theme “Quality Care, Holistic Development”. In terms of administrative structure, the Board of Directors is the governing body assisted by various committees, each overseeing a particular function or service. The Administration Headquarters comprises 7 Divisions and 4 Branches, namely Medical Division, Education Division, Community Services Division, Property Division, Fund-raising Division, Administration Division, Finance & Supplies Division, Human Resources Branch, Information Technology Branch, Corporate Communications Branch and Audit Branch, as well as a Records and Heritage Office, with the Chief Executive as head of the administration. Each Member of the Board serves a one-year tenure with no remunerations. By introducing their social network and experience into the Group, Members of the Board successfully mobilize people from different sectors to support fund-raising activities and enhance the Group’s development; hence creating social capitals for Hong Kong to build a harmonious and mutually supportive society. Taking into consideration of the growth of our services, the Group endeavours to optimize the utilization of government and community resources in a sound and open administrative structure. The Board also strives to strengthen TWGHs’ corporate governance, enhance transparency and accountability to attract support from more donors. Apart from receiving government subsidies, each year TWGHs also organizes numerous fund-raising activities to raise a colossal amount of funds to cover the cost of providing free medical service and the capital cost of expanding various much needed services. Expenditures for Fund-raising events and administration & supporting functions are fully financed by TWGHs Board of Directors/Title Patrons and operating income respectively. No event and administrative costs will be deducted from donations of the general public, which as usual will go to the Group’s services for the benefit of the community. Looking to the future, the Group will continue to provide various much needed services for our community in step with the times. The Tung Wah Group of Hospitals needs your support! For enquiries and more information, please contact us at enquiry@tungwah.org.hk.